Product prices and availability are accurate as of 2019-04-15 13:33:11 UTC and are subject to change. Any price and availability information displayed on http://www.amazon.com/ at the time of purchase will apply to the purchase of this product. FIXKIT Digital Multimeter is absolute a portable and practical measuring instrument in market. 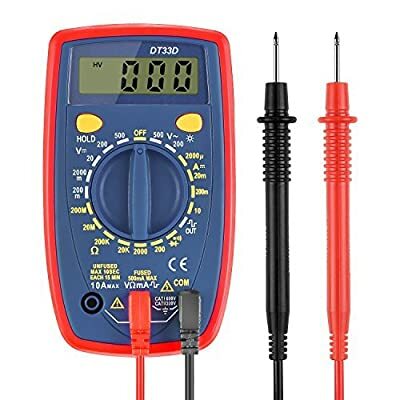 If you still worry about no proper handy multimeter when needed. Our tester will be your best choice, with its excellent stable performance, ideal for electricians, hobbyists, and general household. It can be used to diagnose, assemble, and repair circuitry and wiring. Other functions include a low battery indicator, continuity buzzer, and overload protection. ?Portable & Durable Material Built in high quality lightweight rubber, sturdy, durable and easy to carry and store. It features the drop protection function, for rubber sleeve protects it from the drops and falls. 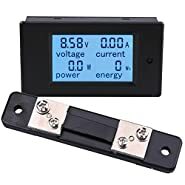 Our Voltage tester can reduce your operation difficulty, you can read the data comfortably from the kit for the large digital display. LCD backlight display, you can use in weak light area no matter what. 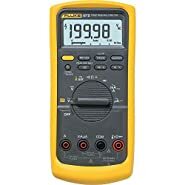 ACCURATELY MEASURES: AC/DC Voltage, AC/DC current, resistance, diode, continuity and more. EASY TO USE: Overload protection and rubber sleeve anti-drop protection on all ranges. Troubleshoots automotive and household electrical problems safely and accurately. LCD BACKLIT DISPLAY: Data hold and back lit LCD with large digital display, it aims to make it easy to operate and reduce the incorrect rate in weak light area. SAMPLING SPEED: 2 times readings per second. Built-in support stand for hand free use. 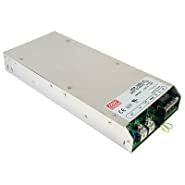 MAX TEST CAPACITY: Max AC Voltage Range: 500V Max DC Voltage Range: 500V Max DC Current: 10A.